The best sources of glucosinolates combined in a single formulation. The best sources of glucosinolates together in a single formulation! Maintaining good health requires regular consumption of vegetables, including those from the important family of crucifers. To get the best out of this group of vegetables, you need to choose fresh over frozen, avoid storing them for too long and take care not to overcook them as it alters and even destroys their most active compounds – which is not always easy. Indeed, even if you serve cabbage and other cruciferous vegetables several times a week, you may be losing out on the health benefits they offer, particularly for the body’s hormone systems, because of the changes they undergo during preparation and cooking. What’s more, the strong taste of these vegetables or the fact that they can cause digestive issues such as bloating and gas can make them unpopular with many people. 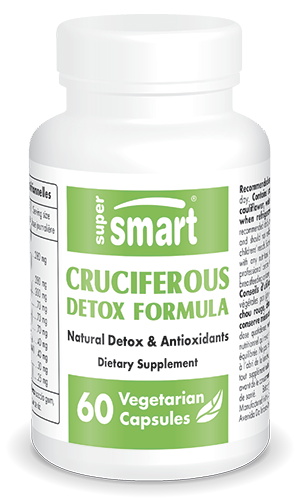 Cruciferous Detox Formula offers all the active substances found in crucifers that not only help detoxify the body, but beyond that - as is now widely-recognised - protect against cancer. Broccoli is rich in glucosinolates, particularly glucoraphanine. Glucosinolates are organic compounds containing sulphur and an amino acid derivative. In order to be converted (hydrolysed) into active isothiocyanates, they must come into contact with the enzyme myrosinase, which occurs during chewing, for example. Among broccoli’s best-known isothiocyanates is sulforaphane which has a particular ability to activate the phase II liver enzymes responsible for neutralising carcinogens, and is recognised for protecting cellular DNA against potential damage. Studies show it offers protection against cancer of the colon, lungs and prostate. It is, however, a naturally fragile compound, but standardisation of broccoli extract now means the body can be supplied with a constant supply of sulforaphane. At low doses, DIM counteracts the action of aromatase, an enzyme responsible for converting certain hormones into oestrogens - such as androstenedione which it denatures into oestrone. DIM is also prescribed for treating prostate problems where dihydrotestosterone (DHT) – the active form of testosterone that stimulates prostate cell growth - is dominant. This powerful antioxidant also prevents chronic infections by neutralising free radicals, induces apoptosis of cancer cells, reduces anarchic cell division and is able to combat angiogenesis of cancer cells. Red cabbage is rich in polyphenols, particularly the antioxidant anthocyanins, and especially glucotropaeloin, a precursor of benzyl isothiocyanate (BITC) which several animal studies have shown can block chemically-induced cancers. Regular consumption of watercress, which is rich in gluconasturtiin (a precursor of phenethyl isothiocyanate –PEITC), lutein and beta-carotene, may lower the risk of cancer by reducing DNA damage, as demonstrated in studies conducted by Professor Rowland of the University of Ulster, and reported in the American Journal of Clinical Nutrition. Extract of wasabi root (Japanese horseradish) and mustard seeds contain sinigrin, a glucosinolate precursor of allyl isothiocyanate (AITC), which is also responsible for these foods’ characteristic pungency. They normalise liver enzymes and protect DNA in cases of inflammation. For maintaining good health throughout life, Cruciferous Detox Formula therefore represents a major ally for men and women of all ages. It can be taken continuously, or several times a year, to complement the recommended minimum intake of 5-a-day servings of fruit and vegetables. Contains extracts of broccoli, red cabbage, cauliflower, cress and mustard.